Single parent family consisting of father, son and daughter set off on a weekend camping trip in a questionable rubber raft. The raft is not white water rapids sturdy and the family loses control and plummets off a steep waterfall. the single family scurries and scrambles for safety eventually holing up in a cave several hundred feet above the ground on the side of a mountain. the family befriends a young apeman who has become separated from his clan. They adopt him to their nuclear family. There exists a race of lizard men who have developed highly civilized society which includes arcane mystical technologies. 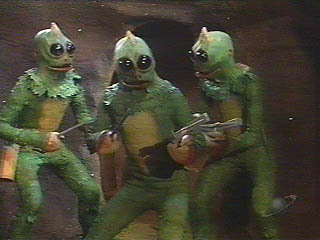 These Sleestak as they are called are immensely hostile to the family with one exception. These Sleestak provide the erudite moral tensions which drive the story line. That original 70's show had a mesmerizing and long lasting effect on me for a number of reasons. Reason number one without a shred of doubt was the reoccurring conflicts with the Sleestak. Sleestaks were a race of lizard men who were apparently highly evolved anthropomorphic beings. They reminded me of those irradiated humans who worshiped some ancient Surface to Air missile and lived below the “Forbidden Zone” in the film “Beneath the Planet of the Apes”. This 2nd “Planet of the Apes” film from the 5 part series is to me the most ironic and therefore most engaging of the whole lot. The Sleestak also seemed to harken back to 802,701 AD where the Morloks from H.G. Wells' “Time Machine” resided. Check out the 1960 version with Rod Taylor playing the sensitive macho lead; plus the Morlok costumes are terrific. Yet, more than that, the Sleestak invoked an Americanization of Japanese monster movies and tv shows. Those adorable rubber suits out of the Gojira franchise or the budding Ultraman empire were translated into an American ideal of evolutionary mishap. Honing my ability to suspend disbelief willingly I owe to captivatingly watching “Godzilla”, “Ultraman” and the “Planet of the Apes” series. But the germ of that ability was planted while soaking up the side stories about the Sleestak from “The Land of the Lost”. Despite the heavy handed scripting of the Sleestak depicting them as the hostile villains I couldn't help routing for them. In retrospect I see it how similar in sentiment it was to attending a bullfight and cheering for the bull. The anticipated excitement of nostalgia ushered me like a lemming to the cashier to buy this DVD. Not only was I soon to be able to indulge my ravenous nostalgia for “Land of the Lost”; I was also about to embark on a 4 part Sleestak fest. The DVD was all about and everything Sleestak. It was a spartan lesson in self control but I managed to keep the DVD sealed until I came back to The Netherlands. This digital Holy Grail was too big; too important for me not to share. Overcome with the necessity of disseminating its knowledge onto a new generation much like a pre-literate nomadic bard recounting the origin myths of the clan; I sat my daughter of 7 down to watch with me. In a word she was nonplussed. She didn't get the plot. She was underwhelmed with the special effects. She just didn't like it; period. In her defense, she was completely and unequivocally right on all accounts. After watching 2 episodes at double speed we looked at one another and decided bilaterally to switch it out for an episode of Sponge Bob. As a self proclaimed film buff I couldn't look beyond the dismal special effects or the gigantic gaping plot holes. I began to wonder if memories, nostalgia and remembrances should remain just the way they are; in the past. As a mantra it seems to function relatively well: things in the past need to stay in the past. Add a mirror and a moment of daily affirmation and you'll at least feel like you're on the road to Wellsville. Once the genie is out of the bottle and you've consciously decided to recall those memories you can't squish the genie back into the bottle. It's what William Burroughs called the “Naked Lunch”. The “Naked Lunch” is that moment dangling in time before you stuff your mouth with the food at the end of your fork. You gaze in existential despair upon the bite in all its glory or its ignominious horror. In the case of the Sleestak DVD or any other object, you can rework your memories by supplanting them with fresh objective new ones. That methodology doesn't adapt itself well when your dealing with emotional memories. The most impish and precocious of emotions is that of love and attachment and affection. This amalgamation of emotions taunts us with its web of memory confabulations spilled out all over both hemispheres of our brains. Those far-reaching memory anchors construct alternative and contra- histories which fog any objective recall. For instance, 20 years of fabricating a contra-history about a the love of your life can't be untangled in a years time once you've let the genie out of the bottle. I am not disparaging the creative process of hypothesizing a “what if ?” coping strategy. Bereavement and dealing with loss is often best suited to a coping strategy centered around “what if? “ scenarios; as long as it doesn't morph into a psychological pathology like Multiple Personality Disorder (now called Dissociative Identity Disorder). However, breaking the Gordian Knot that binds confabulated emotional memories of love and attachment and affection is a long process once you've let the genie out of the bottle. Repairing my Sleestak nostalgia was reasonably easy as I look back. I repackaged my love of the series for what it meant to me then; in a context of time and place. Overhauling a 20 year old alternative history might take some more time. Not all but some things are truly better left in the past.